You might be surprised that only 10 miles off the coast of this bustling tourist favorite world re-known for its wild nightlife there lie uninhabited islands lines with long sandy beaches and crystal clear water. Just 20 miles north of Ocean Marina Yacht Club the island of Ko Sichang offers a step back in time, steeped with a seafaring history dating back hundreds of years and supporting a Chinese style town, a cave-temple and an old Royal Summer Palace. Board the yacht at 9.00 am at Ocean Marina or pick up at seaside location by tender. Sail to a secluded bay chosen after the weather of the day. Snorkel, swim, waterski or fish at the anchorage and enjoy a Thai gourmet style lunch on the yacht. In the afternoon we can choose to anchor off Pattaya Beach, Bali Hai pier or on a different island stop. End the day cruise at Ocean Marina Yacht Club or tender ashore to your hotel. Day Cruise includes use of the yacht and fuel for 3 hours, Captain and Crew Thai Style lunch for up to 8 people, unlimited water juice and soft-drinks, 24 cans of beer of choice and 4 bottles of red/white wine. Board the yacht at 16.00 at Ocean Marina or pick up at seaside location by tender. Enjoy the scenery or go for a swim while we prepare you a Gourmet Style Thai Dinner for up to 8 people. Sail through the sunset with Ko Larn as a backdrop not far off Pattaya Bay. Return to the Marina or Hotel again at 22.00. Sunset Cruise includes use of the yacht and fuel for 3 hours between 16.00 - 22.00, Captain and Crew Gourmet Style Thai Dinner for up to 8 people, unlimited water juice and soft-drinks, 24 cans of beer of choice and 6 bottles of red/white/sparkling wine. Escape the crowds of Bangkok or Pattaya by boarding the yacht at Ocean Marina 18.00 on a Friday night, life is easy again once you let our crew pamper you, and with dozens of deserted islands, white sand beaches and private anchorages just a few miles out from the Marina. Ko Phai, Ko Man Wichai and Ko Khram are uninhibited islands and all have options for beautiful anchorages while Ko Sichang has the charm of a Thai fishing village with some of the finest seafood in the region available fresh from the fishing boat. The Sattahip area also has numerous islands and anchorages where you will not be disturbed and can enjoy water sports and explore. The weekend getaway includes the use of the yacht, Captain and crew between 18.00 on Friday to return 13.00 on Sunday. Fine dining options onboard for breakfast, lunch and dinner. Let us help you suggest a Menu, or should you prefer to eat ashore we can arrange that too. 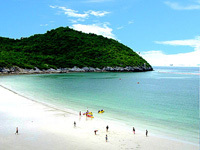 Board the yacht at 13.00 on Friday and sail through the scenic straits of Sattahip, Samae San. Stop for a late lunch and some water-sports at Ko Samaesan before continuing to Ko Samed where we anchor just close off the north bay, have our chef and hostess serve up a gourmet dinner before you head to one of the famous nightclubs on the beach. Saturday we will wake you up with a sumptous breakfast/brunch buffet. We can cruise to the nearby Islands or just stay at the beach enjoying all the the yachts water-sport equipment. The same evening the options are to stay overnight in a quiet bay close to Sattahip alternatively stay one more night at Ko Samet. On sunday we make our way back but stop shortly for swimming at Ko Khram north beach before we return to the Marina around lunch time. Ko Samed weekend getaway includes the use of the yacht, Captain and crew between 13.00 on Friday to return 13.00 on Sunday. Fine dining options onboard for breakfast, lunch and dinner. Let us help you suggest a Menu, or should you prefer to eat ashore we can arrange that too.